We might be hitting the point of typography obsession here at Babyology, but let’s excuse it by saying it’s one that totally applicable to being a parent. After all, we want our children to be alphabet-aware from a very early age these days! 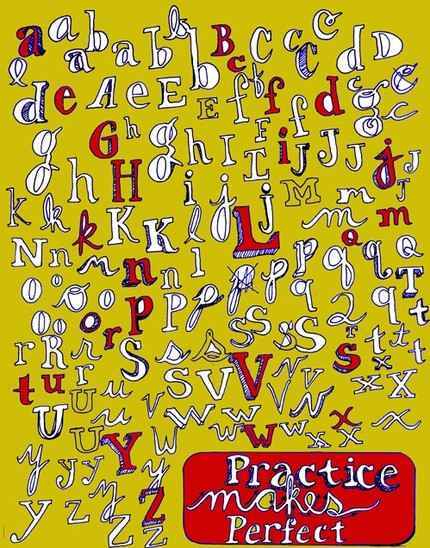 Here’s a divine alphabet print which come complete with a life lesson: ‘Practice makes perfect.’ Sure enough, there are those quaint letters practiced over and over again – with some crossed out – on a charming poster. I have to say it makes a wonderful picture for a school-starter’s room. My son hasn’t been very interested in writing letters and this may be the extra kick he needs when starting school this year. It’s a very reasonable US$15 plus shipping from Wolfie and the Sneak.